Mary Eleanor (MaGuire) Droogan, 91, a lifelong Hudson, MA, resident, passed away peacefully, on Saturday, April 13, 2019, at The Reservoir Center in Marlborough, with her beloved family by her side, after a period of declining health. She is reunited with her husband, Francis “Bud” Droogan, who predeceased her in 1986. Mary was born in Hudson, Ma, on November 24, 1927, a daughter of the late Patrick C. and Ruth L. (Boule) MaGuire. She attended Saint Michael Academy in Hudson and graduated in the class of 1947. 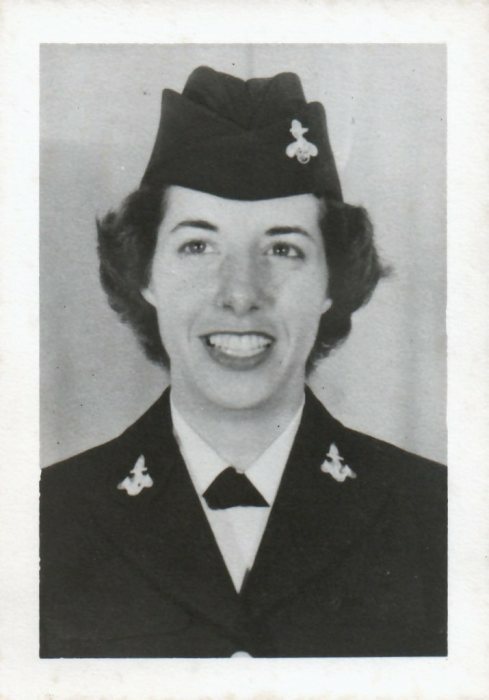 Shortly after graduation, she began her career as a telephone operator with New England Telephone and Telegraph, which was put on hold on December 27, 1950, when she enlisted in the United States Navy, officially becoming a “Navy Wave”. Her duties included loading supply planes, interviewing reservists, and aviation storekeeper, during the Korean War. After four years of honorable service she returned home to Hudson, where she eventually married the love of her life, Francis Droogan. Throughout her life, her devout Catholic faith remained steadfast; attending Christ the King and Saint Michael Parish in Hudson. She was also a lifetime ladies’ auxiliary member of the Hudson V.F.W. Post 1027. Mary is survived by her two children, Michael F. Droogan, Sr. and Patricia Droogan both of Hudson, MA; two grandchildren, Morgan Droogan and Michael F. Droogan, Jr. also both of Hudson and many nieces and nephews. In addition to her parents and beloved husband Francis “Bud” Droogan, she was also predeceased by her two brothers, Walter MaGuire and Robert MaGuire. Relatives and friends are invited to a period of calling hours from 5 p.m. until 8 p.m., on Wednesday, April 17, 2019, at TIGHE HAMILTON REGIONAL FUNERAL HOME, 50 Central St., Hudson, MA. A funeral service will be held at 10 a.m. on Thursday, April 18, 2019 in the funeral home; followed by interment in Saint Michael Cemetery. In lieu of flowers, memorial donations can be made in her name to Alzheimer's Association, 225 N. Michigan Ave., Fl. 17, Chicago, IL 60601; www.alz.org.